Are your contact centre agents truly customer-centric? 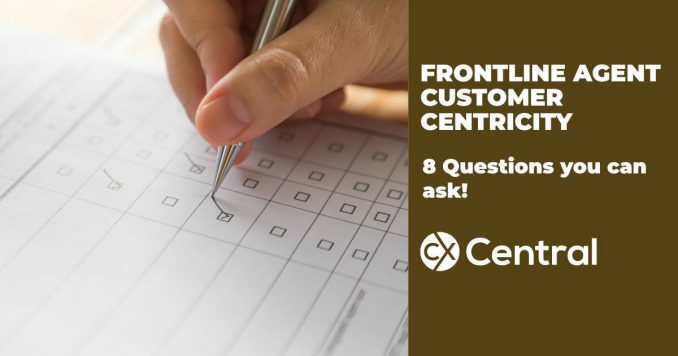 With so many competing priorities, lots of systems, targets and processes for agents to contend with how do you know if your contact centre agents are truly customer focussed? Executives continually claim that the customer experience is their top priority. Whilst it’s easy to say, do the actions demonstrate it? Is the business actually creating a valuable experience for its customers? Is it truly putting the customer first? The same logic to contact centre agents. They may say they care about customers. But do they actually mean it? Moreover, are they empowered enough to actually put that customer centricity into action? Is the customer being put first? Agent perception regarding performance measurement. Are agents evaluated based on how they perform for customers or for the operation? Question 1: Would you rather upset your customer or your boss? Question 2: The customer is attempting to return a product 92 days after his initial purchase. The return policy mandates a 90-day limit on returns. Do you take the item back? Question 3: As a general rule, why/when do you transfer calls to a supervisor? Question 5: You are about to reach your maximum call time. The issue is not resolved. What do you do? Question 6: Your interaction reaches its conclusion. It did not go well. Do you invite the customer to take the follow-up feedback survey? Question 7: The customer proactively gives feedback about the product and/or customer service experience. What do you do with it? Question 8: Why do you deserve a promotion? Search our Business Directory for consultants, trainers and technology that can help improve your Customer Experience.